Arsenal moved back into fourth place with a 3-1 win over West Ham at the Emirates. The visitors struck first through Matthew Jarvis on 40 minutes but their lead was short lived as Lukas Podolski leveled the scores 4 minutes later. Olivier Giroud put the Gunners ahead 10 minutes into the second half before Podolski completed a brace to secure the points. This was a contest between sides with two very different footballing philosophies- the possession-based approach of Arsenal vs. the more direct and physical style of West Ham. Arsene Wenger set out with his normal 4-2-3-1 formation. Olivier Giroud was given the nod up front and Kim Kallstrom got his first Arsenal start. Sam Allardyce set out in a 4-5-1/4-3-3 formation. With Kevin Nolan sidelined with an injury, Allardyce opted for Mohamed Diame, Mark Noble and Antonio Nocerino in the middle of midfield. He played two proper wingers in Jarvis and Stewart Downing. West Ham defended with a midfield bank of 5 in an effort to crowd the middle of the pitch. Arsenal like to play through the middle with quick, short passing combinations. Defending with three center midfielders and leaving only Carroll further up the pitch was Allardyce's effort to deny Arsenal's attacking midfielders space around the penalty area where they like to operate. The 4-5-1 shape meant that Carroll was isolated up front when West Ham won the ball back and the visitors therefore didn't have an outlet pass through the middle to spring attacks. Instead, they looked to find Jarvis and Downing sprinting in behind the Arsenal fullbacks. The two are old school wingers that stay wide and cross frequently. Their inclusion signaled Allardyce's strategy to frustrate Arsenal by defending in numbers then attacking through the channels and looking to take advantage of Carroll's aerial ability with crosses into the box. The strategy was fairly effective in the opening half. 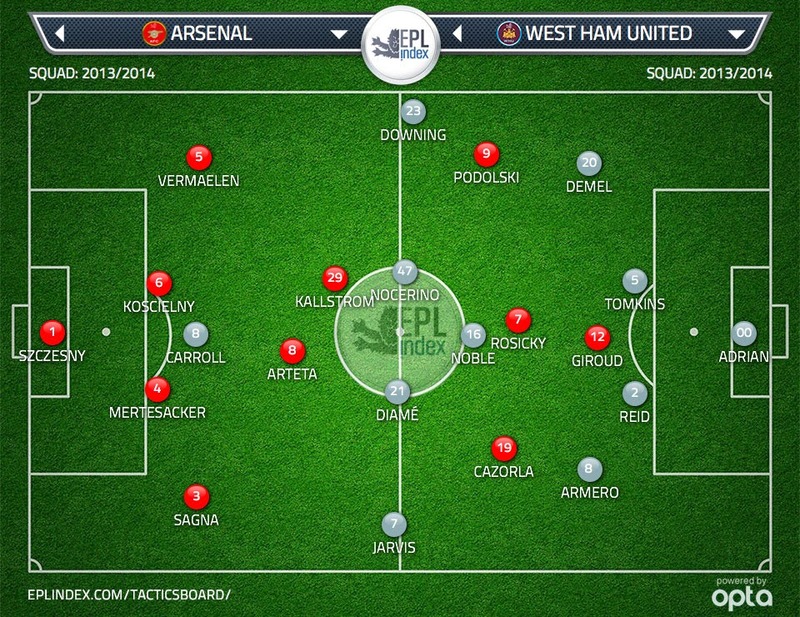 Arsenal didn't look especially threatening and West Ham put a few dangerous balls into the box from wide areas. West Ham were also dangerous when Diame and Nocerino made delayed runs into the box past Arteta and Kallstrom in midfield. Three times in the opening quarter hour Diame sprinted in behind Arteta towards the left edge of the penalty area and played dangerous balls across the face of goal. Nocerino was able to sprint past Kallstrom into the right side of the box for West Ham's opener. Allardyce voiced his frustration at his side's inability to see out the half with their lead in tack in his post game comments. Despite defending well in the opening half, West Ham too often put themselves under avoidable presser by giving the ball away cheaply in their own half. With the score still level at 0-0, Mark Noble gifted a pass to Cazorla who put Giroud through on goal. Giroud's tame effort was saved by Adrian but the visitors would ultimately be made to pay for silly errors when Downing's ill advised clearance into the center of the pitch allowed Cazorla to play Podolski through for the equalizer. The second half was a more one-sided affair with Arsenal establishing control. Their go-ahead goal was interesting in that it was the type you'd expect West Ham to score. After West Ham dealt with the initial ball in from an Arsenal corner, Vermaelen looped a hopeful ball towards the back post that Giroud controlled wonderfully and finished between Adrian's legs. Arsenal pressed higher up the pitch more often in the second half, forcing West Ham into hurried clearances towards Carroll. Had Arsenal not just played an exhausting 120 minutes of FA Cup football Saturday, they'd have likely done more heavy pressing high up the pitch early on in the contest accompanied with a high defensive line. West Ham don't have the composed, slick-passing midfielders to pass their way out of heavy pressure and a high line takes Carroll away from the penalty box where he's at his most dangerous attacking crosses and providing knock downs. The English striker lacks the pace to threaten a high defensive line with runs in behind. Aaron Ramsey's 18 minute cameo served to remind Arsenal fans just how much they've missed the Welshman in his extended absence with injury. Prior to his introduction Arsenal at times seemed to move the ball too slowly to really trouble the West Ham midfield. Ramsey's directness and energy lifted the tempo and Arsenal played much more vertically once he came on. His cushioned header for Podolski's second was as delicate a headed assist as you're likely to see.